I obtained this from Plant Delights Nursery in June, 1997. It came with a small offset which I planted in a lily pond. The one in the lily pond has a grown 2-3 leaves at a time and has maxed out at roughly 5" leaves. The one planted in soil currently has 20 inch leaves and will probably be considerably larger before I have to bring it in for the winter. That's not bad for a small tuber in its first year. 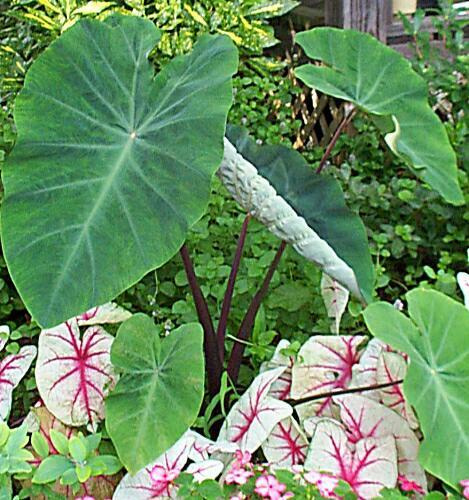 The underplanting is Caladium "white queen".